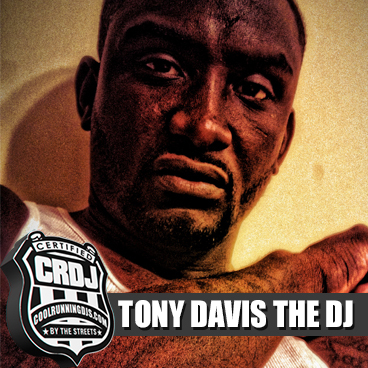 Tony Davis The D.J is the son to Aprilla Davis & Tony Davis Sr.. He was raised with 4 other siblings. Born in Maridion, Mississippi and raised in the small city of Dothan, AL, his father was a hustler and his mother was a Navy Veteran. In 1984, the birth of Tony Jr. changed his father forever and he stopped hustling and started a 9 to 5. In 1986 they moved from Mississippi back to their hometown of Dothan, Alabama. Growing up in Jamars Apartment Projects for a few years on the Eastside of the city young Tony was exposed to hardship, drugs, and gang activity. Tony was never interested in banging. He always had a love for sports and music. His love music grew from two uncles who hustled and played all the new music in loud and fast cars. In 1991 Tony's parents packed up and moved all of them from them projects to the middle class neighborhood of Napier Field on the Northside. It was a entirely different way of living then he was used to. This was all credit to the hard work and years his mom put in as a Navy Veteran. In early 1993 young Tony's world was crumbled when his mother fell to a heart attack from complication from lupus. To make matters worst all the pressures were wearing on his father and he struggled to make ends meet and maintain the household. By spring of '93 things were looking down for his mom. After getting sent to VA hospitals around the country his mom lost her battle in fall of '93. Young and confused, Tony vented through fighting and getting into plenty of altercations in school. By the age of 14 Tony was hustling so that he could keep up with classmates in all the latest fashions in which his father couldn't afford to buy him. Soon he turned negatives into a positive and started writing music. He later learned to produce and engineer music. With that talent he began to be known as a great rapper. By the age of 15 he'd recruited some of his close friends from all around the city of Dothan to form Cowboyz Ent. (Cowboyz was the name of his crew from the Eastside). By the age of 18 he and his team were in all local talent shows and winning. At age 19 he and his brother invested into their first barbershop. He's always been known as "bossed up" with the mentality of playing by his own rules and winning. In high school he started to DJ house parties along side his childhood friend B. Jizzle for nothing but fun. A late graduate, Tony was already on the road to success by the age of 20 after graduation. In the summer of 2005 he attended Wallace Community College for his 1st and only semester in college until his world would once change for the worst. On July 4th, 2005, on his mothers birthday, 21 year Tony was shot once in the upper torso in the Johnson Homes projects area at a get together for reasons unknown. His loyalty to friends and the place he once called home almost cost him his life. Some of Tony's closest friends started to show their true sides and a grew real distant from him during this time of need. In late April of '06 Tony was finally released from the University of Alabama In Birmingham Hospital. Through all kinds of complications with his health throughout that time and the loss of friends and people he loved the most, he kept a high spirit. To add to his problems his grandmother who he's credited for his determination and attitude was affected heavily with Alzheimer in which caused her to be entered into a nursery home. Fast forward time to 2008, Tony's friend from school and promoter from Dothan, Nathan "Nate Dizzle" Patterson walked in his shop to get a haircut and while getting a haircut Nate heard Tony mixing in his office just to make time go by and at that moment told Tony "You're going on the road with me". From that day on they've been joint at the hip to form It's Time Ent. hosting, promoting, and djing every major urban event in the Wiregrass area since. Tony often credits his success to Nate for making him believe in a dream he never had and seeing a talent he never saw in himself. 4 Years later he's at a point he'd always know he'd be at even as a kid. A beautiful wife, 2 kids, and great supporting family around him keeps him grounded and humbled. He lives by the motto of "Morals over everything" and it pays in heavy way. He still dreams but not only does he dream on it, he acts on it which leads the world to believe there's only one way to go with this young man and that's up!! !